Haiti's interim president has warned his country risks "real famine" following the "apocalyptic destruction" of Hurricane Matthew. Jocelerme Privert said famine could take hold within three to four months if the situation was not managed properly. It comes as UN Secretary General Ban Ki-moon called for a "massive response" to help the country. The category-four storm is believed to have killed as many as 900 Haitians. How do Haiti and Florida compare? Mr Privert said the loss was "amazing", saying food, water and medicine was immediately needed. "But the concern is if we don't take action now for the longer impact... three to four months when the foods stop coming we are going to have a real famine." He described seeing "apocalyptic" destruction. "What I saw with my eyes yesterday will take a lot of effort to work on the reconstruction part of what has been destroyed," he said. Matthew was the strongest hurricane to hit the region in a decade. The UN has launched an emergency appeal for nearly $120m (£97m) in aid to cover the next three months. Speaking to reporters on Monday, Mr Ban said: ""Hundreds have died; at least 1.4 million people need assistance at this time. 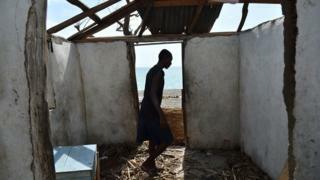 "Some towns and villages have been almost wiped off the map; crops and food reserves have been destroyed; at least 300 schools have been damaged,"
The UN humanitarian agency issued the appeal to help provide "life-saving assistance and protection" for 750,000 people in south-western Haiti over the next three months. Officials were still struggling to reach the hardest-hit areas, the agency said, with communities in need of food, clean water and clothing. There were growing fears that flooding could cause a cholera outbreak similar to that after the 2010 earthquake. The waterborne disease reached the island via Nepalese UN troops, causing the deaths of nearly 10,000 people. A treatment centre in the town of Jeremie has become overcrowded with not enough beds for patients, and some of them were being forced outside, reports said. Many of the cases involved children. Other countries including France and the US have pledged to send aid. The Red Cross has launched an emergency appeal for $6.9m (£5.6m) and Unicef said it needed at least $5m to meet the immediate needs of 500,000 affected children. Meanwhile, at least 21 have been killed by Matthew in the US, 10 of them in North Carolina, most of them swept away by flood waters. "Hurricane Matthew is off the map. But it is still with us. And it is still deadly," Governor Pat McCrory said. There were also four deaths in Florida and three each in Georgia and South Carolina. One death was reported in Virginia. Nearly 1.2 million people were without power. Are you in any of the affected areas? You can share your experiences by emailing haveyoursay@bbc.co.uk.